During Star Trek: Mission New York I had the opportunity to speak with Steve Ricossa, Executive Producer of Star Trek Online, and play a demo of the game. Star Trek Online is a free-to-play multiplayer online game where players can pioneer their own destiny as Captain of a Federation starship, become a Klingon Warrior and champion the Empire through the far reaches of the galaxy, or rebuild the Romulan legacy as the commander of a Romulan Republic Warbird. Click here for the Trailer. The game, produced by Perfect World Entertainment Inc., a leading publisher of free-to-play MMORPGs, and Cryptic Studios, is available now on PC and will be available on PlayStation®4 and Xbox One in September 6th 2016. Steve provided me with an overview of the game and was my guide as I played the demo version of the game. 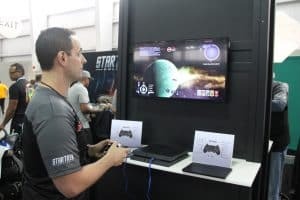 The system I demoed the game on was the PS4 and as an average gamer I felt that the controls were not overly complicated from the outset so I was able to jump right into the action for a space battle. There is a bit of customization through the ‘Command Wheel” which allows for quicker access to functions or simplified decision-making during gameplay. Gamplay is not only ship-based but also planet-based. Players command their ships in space and also assemble away teams to transport down to a planet’s surface for ground missions. Ship-based flight was exciting as I commanded the Defiant in a battle against a Borg sphere. On the ground my away team rescued some scientists on a base which was overrun with Borg and helped them as part of the mission objective. During my ground mission the team fought off a number of Borg and also ran into Species 8472. Navigating on the ground was effortless and fighting was certainly fun. You can engage in combat one-on-one or have your away team focus on a single enemy. The gameplay experience is enhanced with a fleet progression system as well as a rich end-game. Additionally, there is some customization within the game for purchase through the collection of Dilithium – the currency within the game. As you collect enough Dilithium you can purchase items like ships and costumes. Captains can explore the galaxy, visiting all 4 quadrants, including 100+ iconic Star Trek locations. During these missions, they will interact with original characters from the television show voiced by Trek actors, including Walter Koenig, Jeri Ryan, Michael Dorn, Tim Russ, Denise Crosby, Chase Masterson, Ethan Phillips, Garrett Wang, Robert Duncan McNeill, and more. Star Trek Online on PS4 and Xbox One will launch with over six years of content, including over 130 featured episodes. The episodes are tied to the Star Trek Universe which allows the player to experience story lines from the various incarnations of Star Trek. 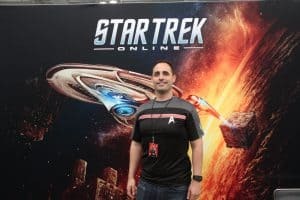 In addition, the game will receive regular updates to include new locations and characters straight from the Star Trek universe – estimated 4 per year. A brand new User Interface (UI) and control scheme has been added, allowing players to navigate both space and ground combat with ease. Modern lighting technologies have also been added to improve the overall visual quality of the game. My verdict – This is a great game and it has a lot of depth to immerse players for many hours of gameplay. With add-ons delivered periodically through-out they year there is incentive to continue playing long-term. As a Trekker the opportunity to explore and interact in Trek Universe is a huge draw. The inclusion of the Trek cast members as voice characters within the game is an additional draw for any Trek fan. This is a game I highly recommend – check it out. The game is rated “T” for teen. Price: Free – updates are free as well. Click here to join the Gaming discussion on the FoCC forum.